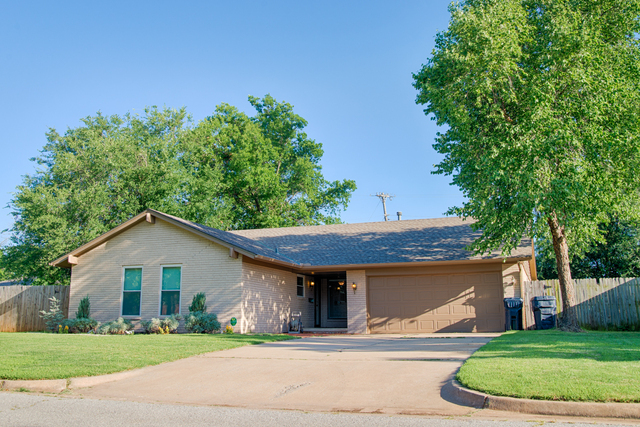 Lot Size: 76x125 Square Ft.
Great Modern style to this updated home in the NW OKC. Spacious open floor plan with kitchen, living and dining all open to each other. There have been many updates to this home that include, flooring in living and dining room, neutral wall colors throughout, light fixtures and can lights, master and hall bathroom vanity, and 2 inch blinds throughout the house. The kitchen also has updated cabinets, counter tops and appliances. Master suite includes a full bathroom with shower and walk-in closet. There are two additional bedrooms off the master with a hall bathroom as well. Nice size backyard w/ open patio made of brick pavers.